Granada, 1278. At the foot of the Sierra Nevada mountains, one of the most exciting and interesting projects of the Spanish Middle Ages begins: the construction of Alhambra. Each round, you must decide: Do you take a currency note, so that later on you can acquire a valuable piece of the Palace - a Pavilion or a Manor for example? Or do you purchase one of the available Palace pieces to expand your Alhambra? Be careful as you won't receive any change. However, if you can pay the exact amount, you will get another turn immediately! During the scoring rounds, you will receive Victory Points for having the majority of any type of palace piece. But that's not the only way to score points: the longer your City Wall, the more protected your Alhambra will be, earning you additional points. 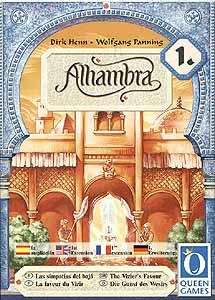 The RDG Team hasn't gotten around to writing a review for Alhambra: The Vizier's Favour. YET. We're writing up new reviews all the time. (And adding new games to review!) And this one is on the To Do List. But we could really use your help! If you'd like to say a word or two about Alhambra: The Vizier's Favour, click here and we'll put it online!